Hello everyone, and I'm officially back in the quilting business! I know some of you don't remember me, but I've been running the www.QuiltingBusiness.com web site for over five years now, and I also have a number of other quilting-related web sites that I run. But, about a year ago, I had to take a full-time job (my accountant assured me that if I kept taking money out of my retirement fund, it would be gone by the time I retired), and I got kind of burned out on running the web sites and doing the whole “9 to 5” day job thing. So, for the past year, I've been spending most of my spare time watching the kids do their various sports and activities, and watching our puppy Ginger grow into a rambunctious dog. I decided to take a look at my web sites to figure out if they were worth re-registering. And you know what? I was still getting traffic and still making some sales, all without any promotion at all. I knew I was making a few sales every month, but when I added it up, it amazed me that there were as many people able to find me without any online advertising. These people really wanted to know how to make money with their quilting. They really wanted to start a quilting business. So, what I decided to do was to simplify my quilting business life. I took a look at all the different quilting web sites I had, and decided to trim it down to only those that made sense. I also decided to consolidate all of the quilting business communication to one email list, and to turn www.QuiltingBusiness.com into a blog so I could quickly update the blog and also offer the ability for the Quilting Biz community to comment and interact very easily. That decision was made about 2 or 3 weeks ago, and I've finally finished the blog and updated all my sites. And now, I'm ready for the big unveiling. 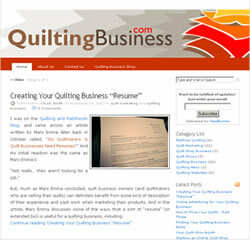 www.QuiltingBusiness.com – My main web site and the Quilting Business Blog. I'll use this site as the main focus of my communications. www.QuiltersTips.com – Home of the top quilting tips on the Internet, and also a weekly contest for your best quilting tips. www.TopQuiltersTips.com – Just a place that shows a bunch of the top quilting tips from www.QuiltersTips.com. It was such a nice surprise to see that so many people were still interested in starting a quilting business. I would never have guessed it, although I should based on the wonderful emails I have received from everyone over the years. I've been truly humbled by the generosity of the Quilting Biz list over the years, and I regret I haven't kept up with the list the way that I should have. And that's all going to change. Over the next couple of weeks, I'm going to be delivering some good information that is designed to get you going in your own personal quilting business. 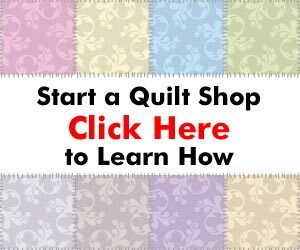 This information will include some great free software and web sites that will allow you to get the most out of your computers and the Internet, as well as some good, solid marketing and business information to help you jumpstart your quilting business. As always, please feel free to send me any questions or any resources you think will help others. There's also www.QuiltersTips.com for adding your own quilting tips to the community. I know how giving this group is, and I want to make sure all of the new people who have been added to the Quilting Biz community over the past year, while I've been quiet, get as much out of it as possible. So thanks once again for caring, and I look forward to offering some great information in the weeks to come. Glad to see you back with a new look and blog. Noooo, you were not forgotten. I just figured you took a vacation:) Thanks for caring and coming back with the new blog…I LIKE IT! So glad to see you do this….I read all your articles and although I do not as of yet have my own quilting business I do file the information away for a good rainy day as I eneter retirement years I hope to place them to good use! So please keep up the awesome work you do! Welcome back. I have very much appreciated your articles and am looking forward to reading your blog in the future. I am still thinking about starting a quilting business but need some more practice machine quilting before selling my quilts. I recently began quilting again after about a 20 year lapse while busy raising a family and working. I only hand quilted then but now am doing most everything on my wonderful old Singer 201. I thought it would be easier than hand quilting but it sure isn’t. So a little more practice for me and then on to selling. I will be using the information that I have learned through your articles.